The installation of a new master is a wonderful ceremony and is the highlight of a lodge’s calendar and when it is conducted in the manner that City Lodge No 2514 installed its new master, it is an occasion that will live long in the memory. David Anderton (left) congratulates Anthony Summers. WM Andrew Prowes welcomed the visitors, among the visitors there were three masters in office and three PPrSGW’s. 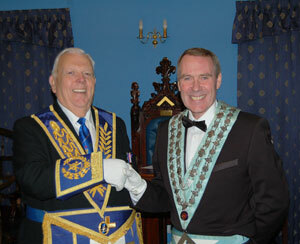 Andrew opened to the lodge in the usual manner to carry out the administration business of the lodge. On completion, the lodge was raised to the second degree before the director of ceremonies, Stephen Riley, requested permission to retire for a short time. During his absence, the lodge was raised to the third degree before Stephen returned to announce the presence of the principal guest of the evening, David Anderton representative of the Provincial Grand Master Tony Harrison stood without and sought admission. Andrew said the lodge would be delighted to receive him. David entered in due form accompanied by Woolton Group Vice Chairman Mike Cunliffe, to be formally welcomed by Andrew. Salutations were given before the lodge returned to the second degree, Andrew asked for the presenting officer Bob de Asha to present master elect Anthony Summers. The officers for the ceremony of installation were then duly placed with Eric Shepherd occupying the senior warden’s chair, George Powell occupying the junior warden’s chair and Tom Arnold undertook the duties of inner guard. Returning the lodge to the third degree, Andrew thanked the officers and brethren of the lodge for all their support during his year of office. He then went on to install Anthony Summers as his successor in the master’s chair. Now as master, Anthony had the pleasure of investing Andrew as the immediate past master of the lodge, there followed a superb rendition of the working tools of an installed master by Stephen Riley jnr. David Anderton (left) takes wine with Anthony Summers. Delivery of the working tools was expertly done by junior members of the lodge; Arthur White in the third degree, George Powell in the second degree and Ian Barton in the first degree. Anthony Summers then invested the officers of the lodge for the ensuing year. The address to the master was given in a sincere manner by Bob de Asha who initiated Anthony into City Lodge, the address to the wardens was by Colin Roberts and to the deacons by Peter Johnson, David Anderton conclude the addresses by delivering the address to the brethren of the lodge. At this point David stood to offer Anthony the congratulations of the Provincial Grand Master, who he said, hopes Anthony enjoys his year of office and that the brethren continue to enjoy their Freemasonry. He went on to offer congratulations, not just to Anthony but to all those who had taken part in the ceremony and offered Andrew a special word of congratulation for a job well done. Anthony then presented two cheques to David, one for the sum of £250 in support of the MCF 2021 Festival and another cheque for £50 to Tithebarn. On behalf of those who would benefit, David offered his thanks to the brethren. 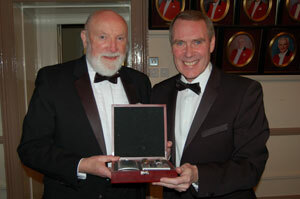 Bob de Asha (left) presents Anthony Summers with an engraved hip flask. After the first rising Stephen Riley Snr formed the procession to retire, upon leaving David was accompanied by Woolton Group Chairman Andrew Whittle, who unfortunately due to unforeseen circumstances arrived a little late. The remaining business of the Lodge was completed the lodge was closed, the brethren the retired to the festive board. During the festivities and in response to the toast to the grand officers, David Anderton offered his own congratulations to Anthony and all those involved in the ceremony, which had been carried out to the highest standards. He made mention to three points; the first being membership which he said it was a responsibility to us all, not just the membership officers. The second point was the Royal Arch, which he asked those who are not members to consider joining to complete their journey in Freemasonry. His third point was the MCF 2021 Festival and its work. Before the Lodge was closed Bob de Asha, who initiated Anthony into City Lodge presented Anthony with an engraved hip flask to mark his installation. 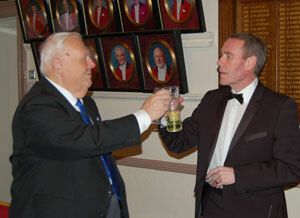 Sadly, the evening drew to a close with Tom Lunt giving the final toast of the evening, the tyler’s toast. Pictured from left to right, are: David Anderton, Anthony Summers, Mike Cunliffe and Andrew Prowes.